The PT300 is a sturdy, all aluminum, fully electronic, self-contained wheel load scale that is capable of weighing loads up to 25,000lbs (12,500kg) with an accuracy of ±1%. 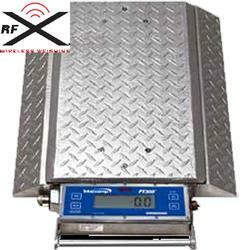 PT300 scales feature Fully Integrated RFX Wireless Weighing Technology and are designed to maximize legal payloads with concern for violations and reduction of maintenance due to overload stress on equipment. The PT300 is a sturdy, all aluminum, fully electronic, self-contained wheel load scale that is capable of weighing loads up to 25,000lbs (12,500kg) with an accuracy of ±1%. 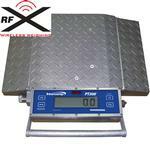 PT300 Scales are sturdy, portable and compact. Lightweight and accurate, this all-aluminum design is ideal for uneven surfaces and withstands most weather conditions. The PT300 is designed to maximize legal payloads with concerns for violations and reduction of maintenance due to overload stress on equipment. The scales are fully battery operated and only require infrequent recharging that can be accomplished by any 12, 110, or 220 volt power source. A charger adaptor is provided. The I/O terminal will also transmit required data to a printer or a display, such as Intercomps S400HI ultra bright digital display. Also available are optional carrying cases that exceed government specifications. The PT300 900 MHz Series of scales are designed to maximize legal payloads with concern for violations and reduction of maintenance due to overload stress on equipment. 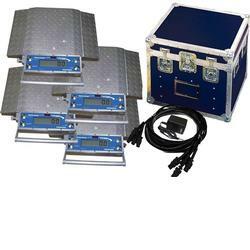 The PT300 868 MHz Series of scales are designed to maximize legal payloads with concern for violations and reduction of maintenance due to overload stress on equipment. The PT300 DW scales are designed to maximize legal payloads with concern for violations and reduction of maintenance due to overload stress on equipment. The PT300 DW is a sturdy, all aluminum, fully electronic, self-contained Double Wide wheel load scale that is capable of weighing loads up to 40,000lbs (20,000kg) with an accuracy of +/-1% and is available in double-wide configutations for wider tire configurations. The scales are fully battery operated and only require infrequent recharging through 12V, 110V, or 220V power sources. Standard AA Batteries last up to 300 Hours in the Scales. The display can be lit for night use and it is possible to sequentially couple and number PT300 DW scales in the series for the purpose of obtaining a total vehicle weight through the total button as well as link the scales to a computer, indicator, or Intercomps PT20 Universal CPU. The I/O terminal will also transmit required data to a printer or a display, such as Intercomp"s S400HI ultra bright digital display. Also available are optional carrying cases that exceed government specifications.